This article is long, so I’ll spare you a lengthy intro. Here’s everything you should need to know in order to dominate your Week 11 DFS tournaments and cash games. On Friday, HC Doug Pederson said “Golden Tate is much further along this week. (He) will have a bigger role this Sunday.” It’s hard to imagine Tate (DK: WR19, FD: WR14) wasn’t going to see a bigger role after playing on only 18 (of 62 snaps) last week. But maybe by “a bigger role” Pederson meant “a much bigger role” or that Tate would see “a full-time role”. In this case that would imply a dent to Nelson Agholor’s projections (Tate ran nine of 15 routes from the slot last week). Really, it’s hard to come up with a serious takeaway from this quote, and it’s hard to trust Tate after last week’s dud. Still, it’s worth mentioning his soft matchup. New Orleans has been the league’s toughest defense against tight ends over the past two seasons and top CB Marshon Lattimore is likely to shadow Alshon Jeffery, but New Orleans ranks bottom-10 to WR2s and slot wide receivers. After trading Tate two weeks ago, Detroit will be without Marvin Jones (knee) and Michael Roberts (shoulder) for Sunday’s game. This unequivocally makes Kenny Golladay (DK: WR15, FD: WR18) a top play. Jones exited last week’s game early (final drive of the third quarter) due to injury, which helped Golladay reach a new career-high in targets (13). He caught six of those targets for 78 yards and a score. He’ll have a more neutral matchup this week. Luke Willson (DK: TE25, FD: TE28), who leads Detroit’s tight ends in snaps and targets, is also in play this week at a near-minimum price-tag. Joe Flacco is doubtful for Sunday’s game. If Robert Griffin III (DK: QB22, FD: QB23) is announced as the starter, he’d be in play given his low price-tag and the great matchup. He’s had at least five rushing attempts in each of his last eight games, though there is concern Lamar Jackson (DK: QB22, FD: QB15) could come in and steal some work (a la Taysom Hill). The Bengals are giving up the most fantasy points per game and the second-most rushing fantasy points per game to opposing quarterbacks. If Jackson is announced as the starter, I’m going to be massively overweight compared to the rest of the field. This article explains why. Torrey Smith is out for Sunday, which pushes D.J. Moore (DK: WR39, FD: WR39) into contention as a strong punt-play option. Moore averages 24.5 more snaps per game when Smith has sat out and also has our top WR vs. CB Matchup of the week. The Buccaneers will be without Vinny Curry (DE), Lavonte David (LB), Justin Evans (S), and M.J. Stewart (CB) this week, while Carl Nassib (DE) is also questionable. This makes Eli Manning (DK: QB15, FD: QB20) and Saquon Barkley (DK: RB2, FD: RB2) (who were already great plays) even better plays. Just as a receiver, Barkley is averaging 14.1 fantasy points per game, which would rank 24th among all wide receivers. Running backs have been targeted 61 times against Tampa Bay this year. On those 61 targets, Davis or Kwon Alexander (now on I.R. with a torn ACL) were the primary defenders on 33 of those throws (54%). So, this looks to be a very exploitable matchup for Barkley, not even counting the rushing production (top-10 in rushing yards and rushing touchdowns). This also boosts Manning in what was already a top-tier matchup. Tampa Bay has surrendered 2.56 passing touchdowns per game with an opposing passer rating of 122.3. Not only are those numbers worst in the league this year, but they’d rank worst by any defense this past decade. Tajae Sharpe (DK: WR51, FD: WR53) and Taywan Taylor (DK: WR55, FD: WR65) are questionable for Sunday’s game. If Taylor is out, boost Sharpe if he plays. If Sharpe is out, boost Taylor if he plays. If both are out, Cameron Batson (DK: WR68, FD: WR65) is a “fine,” but probably not “great” punt option. If either or both are out, boost Corey Davis (DK: WR17, FD: WR21), who I like quite a bit (more on him later). Jordy Nelson and Martavis Bryant are ruled out for Sunday’s game against the Cardinals. I suppose this pushes Brandon LaFell (DK: WR55, FD: WR31) in play as a punt-option. Nelson played on 68% of the snaps last week, and LaFell out-targeted him six-to-one. Jared Cook (DK: TE9, FD: TE8) also gets a significant boost – he saw nine targets last week and has easily been Oakland’s best receiver this year. That said, Arizona has been one of the toughest tight end matchups all year. Keke Coutee (DK: WR33, FD: WR28) is a game-time decision this week. If Coutee is out, we should expect DeAndre Hopkins (DK: WR4, FD: WR3) (12 targets in Week 9) and Demaryius Thomas (DK: WR26, FD: WR28) (three targets in Week 9) to see a bump in targets. Jamison Crowder and Chris Thompson are out for Week 11. This doesn’t really move the needle for me. If Maurice Harris didn’t hit last week, I don’t see why he would this week. Thompson might boost Adrian Peterson a tad, but the matchup and projected game-script keep him out of play. A.J. Green is out this week, as we all expected. In a tough all-around matchup, no one really stands out. Tyler Boyd (DK: WR8, FD: WR12) will go low-owned this week after disappointing last week. C.J. Uzomah (DK: TE13, FD: TE14) will still be drawing a massive snap share with Tyler Eifert and Tyler Kroft out. John Ross (DK: WR35, FD: WR31) is currently questionable, but he’s likely to play and viable as a punt-option for tournaments if he does, though he wouldn’t be someone I’d be particularly excited to play. The team might instead lean more on the run-game (Joe Mixon) with Green out and Baltimore’s quarterback situation murky, though Baltimore has been stout against the run all year. Chad Williams is out for Week 11, which means the Arizona passing attack should continue to be as highly concentrated as its been over their past two games. Royce Freeman will play in Week 11, which means Phillip Lindsay (DK: RB15, FD: RB13) is no longer a value. Darius Slay will be all-systems-go for Sunday’s game. He’ll be in shadow coverage against Devin Funchess (DK: WR23, FD: WR26) for the near-entirety of the game. 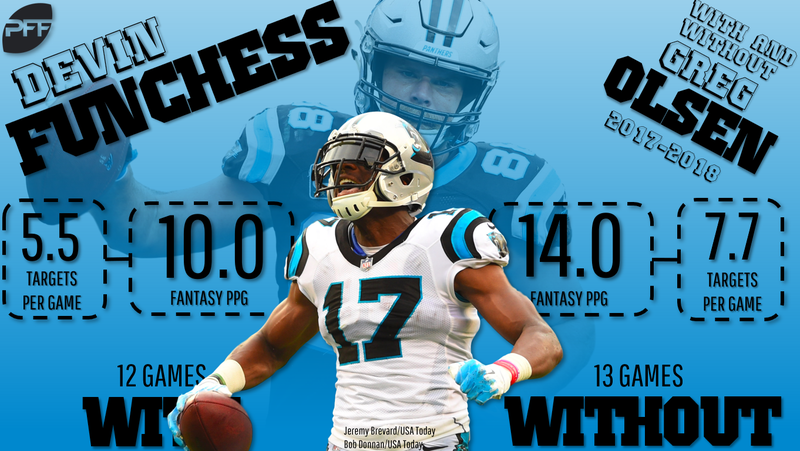 This makes Funchess an easy fade, while Greg Olsen (DK: TE2, FD: TE2) and Christian McCaffrey (DK: RB5, FD: RB4) get slight boosts to their target projections. Chris Godwin is questionable for Sunday’s game against the Giants. If out, this bumps Adam Humphries (DK: WR44, FD: WR31) and DeSean Jackson (DK: WR25, FD: WR19), who have been operating in a three-way platoon for the majority of the season. Jackson always has slate-busting upside, and Humphries has seen tremendous volume in recent weeks (as outlined here). Still, the matchup is tough for both players, as New York ranks top-10 in fantasy points per game to wide receivers on deep passes and best in fantasy points per game to opposing slot wide receivers. For six straight games, Wentz has thrown for multiple touchdowns and at least 275 yards. He follows up tough matchups against Jacksonville and Dallas to face a New Orleans defense that ranks dead-last in schedule-adjusted fantasy points per game to opposing quarterbacks. Volume shouldn’t be a concern for Wentz, as 8.5-point favorites and with New Orleans funneling action through the air (79% of their allowed yardage has come via the pass, which ranks most in the league). The Saints rank fourth-worst in passer rating, third-worst in fantasy points per dropback, but are leading the league in rushing yards allowed per carry (3.28). Wentz is an easy top play this week on FanDuel, and though the second-highest-priced quarterback on DraftKings, still a strong value. The old David Johnson is back, or so it seems. Johnson totaled 21 carries and nine targets in Week 10, good for 27.3 expected fantasy points (most at the position) and 37.3 actual fantasy points (most at the position). It seems we can trust new OC Byron Leftwich to use Johnson similarly to how he was used in 2016. Even if not, there is one area where Johnson has excelled all year – usage near the end zone. Johnson ranks seventh among all players in expected touchdowns, and from a market share perspective, this looks even more impressive. He and Todd Gurley tie for the league lead (in expected touchdown market share) with 42.8%, while the next-closest player is at only 32.7%. That’s especially notable this week, as Arizona has its highest implied point total since Week 1, in an ideal matchup against Oakland’s run funnel defense. Arizona is favored (a rarity for them) by 5.5-points. Oakland ranks dead last in rushing yards allowed per game (128.4) and second-worst in yards allowed per carry (5.12). They also rank second-worst in points allowed per drive (3.02) and have seen 35% of their total yardage allowed come via the run (sixth-most). Johnson played on 71% of Detroit’s snaps and set a new high in expected fantasy points in Week 10 (17.5) after just setting a new high in Week 9 (17.0). He ranks second among running backs in targets over the past three weeks (19). This is despite Theo Riddick’s Week 9 return and two games with game-script that would seemingly be more beneficial to Riddick. Over this span, Johnson has seen 26 carries, 11 targets and three opportunities inside the 10-yard line, while all other Detroit running backs combine to total just 12, 16 and 2, respectively. 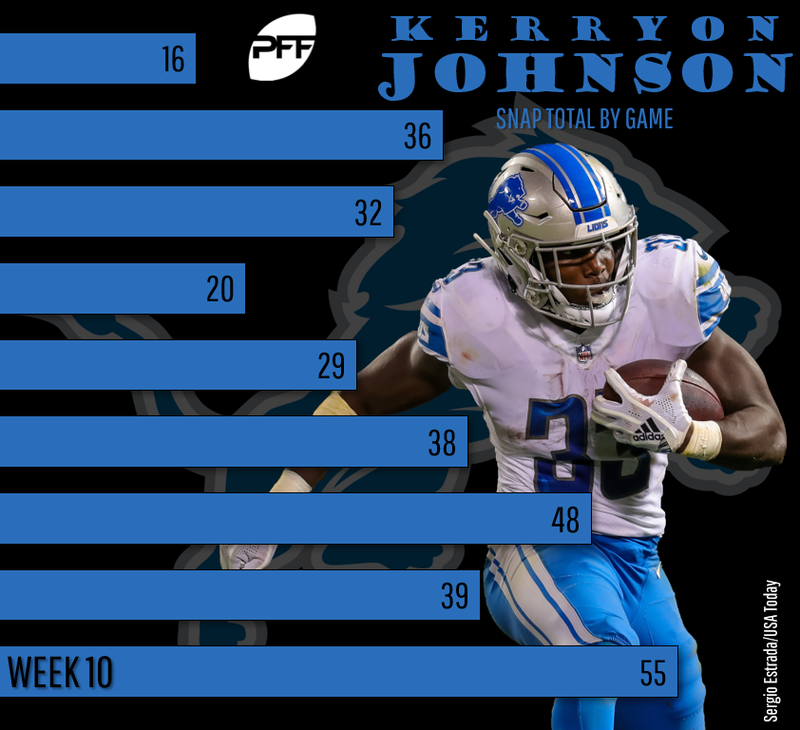 With Johnson now pairing good usage to match hyper-efficiency (ranks third-best in yards per carry and sixth-best in yards after contact per attempt), he’s a clear top value this week. Though the matchup isn’t great, it also isn’t terrible, and he’s one of the cheapest running backs we can project to see at least 20 touches. Cooper has seen a substantial uptick in usage since moving to Dallas but is still priced as though he’s the WR2 on an inferior Oakland offense. Cooper totals 36.5 expected fantasy points over the last two weeks, which ranks fifth-best among all wide receivers. With Oakland, through the first six weeks of the season, Cooper ranked outside of the top-60 wide receivers in expected fantasy points per game. In addition to better usage in Dallas, Cooper has a top matchup this week against an Atlanta defense that ranks third-worst in schedule-adjusted fantasy points per game to opposing wide receivers. Among wide receivers, Shepard ranks 30th in both expected and actual fantasy points per game. Among the wide receivers available on this slate, that jumps to 22nd and 20th, implying an appropriate price-tag if this were a neutral matchup. His two best games this season have come in his two best matchups against Atlanta and New Orleans – the only teams he’s faced that rank bottom-10 in fantasy points per game to slot wide receivers (where Shepard runs 69% of his routes). Now, he gets the ultimate slot matchup, up against a Tampa Bay defense that is giving up 23.8 fantasy points per game to opposing slot wide receivers, which ranks most in the league and 52.5% higher than the league average rate. Tampa Bay, meanwhile, has been much better on the outside, where they’re giving up just 17.8 fantasy points per game (seventh-fewest). Hilton’s usage has been odd this season, at least in comparison to years prior, as outlined in Week 10’s Actual Opportunity report. Still, the production has mostly been there, ranking 28th at the position in fantasy points per game. This is despite some tough cornerback matchups that include shadow games against both Tre’Davious White and Jalen Ramsey over his last three games. I’m willing to bump him up a tier or two this week given the soft matchup against the Titans. Hilton runs the plurality of his routes from Andrew Luck’s left, while Tennessee is giving up the most fantasy points per game to left wide receivers (hello, Malcolm Butler, who leads all cornerbacks in yards and touchdowns allowed). Tennessee also ranks bottom-10 in schedule-adjusted fantasy points per game to WR1s. Fitzgerald is averaging 9.5 targets per game over his last four games. Since Byron Leftwich has taken over as OC (last two games), he’s averaging 11.0 targets and 17.6 fantasy points per game. Oakland is giving up the 12th-most fantasy points per game to opposing slot wide receivers. Davis ranks 14th among wide receivers in expected fantasy points per game (15.5) and fifth in expected fantasy point market share (25%). Of course, until last week, his production wasn’t nearly as good as his volume, but he has had one of the league’s toughest cornerback schedules. That shouldn’t be a problem this week against Indianapolis, who ranks 11th-worst in schedule-adjusted fantasy points per game to opposing WR1s. Against the three other teams he faced that rank in the bottom-12, he averaged 22.7 fantasy points per game. Prelude: I absolutely hate this slate. It’s brutal. I suspect everything hinges upon which high-priced running back(s) and wide receiver(s) you play. The problem is they’re all equally great plays – there’s little separating them in terms of valuation. So, unless you’re going the mass multi-entry route (something I no longer really have time to do due to Sunday morning obligations for the site), you’re stuck hoping you picked right on your guy, even though you didn’t really like him that much more than the other 3-6 guys in that tier. 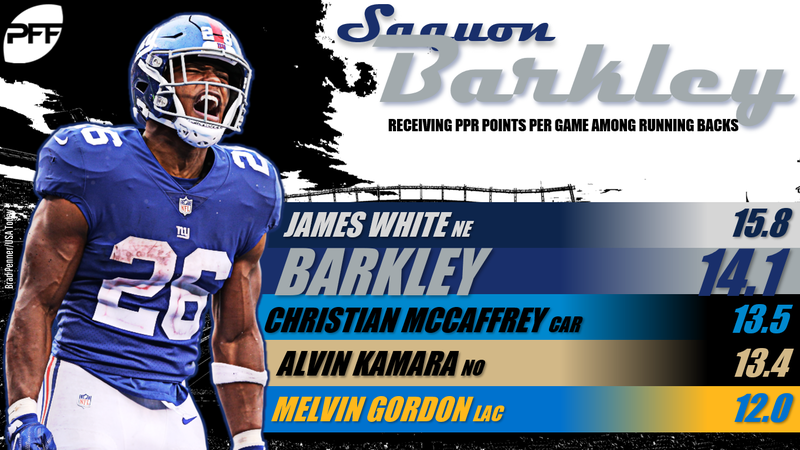 Barkley (DK: RB2, FD: RB2) is an amazing play for all the reasons we highlighted earlier and would be the player I’d project to score the most points this week. After Barkley, I’d say Ezekiel Elliott (DK: RB3, FD: RB5) is the second-most-likely running back to lead the position in fantasy points. By my data, Elliott has had the second-toughest schedule to-date of 40 qualifying running backs. That should change this week against the Falcons. Atlanta ranks third-worst in fantasy points per game (schedule-adjusted or not) to opposing running backs, while also ranking eighth-worst in yards allowed per carry. Volume has never been better for Elliott, ranking second in carries and 13th in targets (already with 10 more than he had all of last year). Efficiency has been there as well (4.9 yards per carry), but one thing has been missing – near end zone usage. He ranks just 17th among running backs in expected touchdowns per game after ranking second-best last year. He should have plenty of scoring opportunities this week, however, as Atlanta ranks fourth-worst in points allowed per drive and Dallas has their second-highest implied point total of the season (22.75). James Conner (DK: RB7, FD: RB6) appears mispriced on DraftKings despite a tough matchup against Jacksonville. Conner ranks third at the position in snaps and fourth in expected- and actual fantasy points per game. Before last suffering a concssion last week (where Conner didn’t receive a single fourth-quarter touch), Conner saw at least six targets in five of his previous six games, while averaging 22.0 carries per game over his previous four games. He’s averaging 24.8 fantasy points per game, which is more than Le’Veon Bell averaged in any season but one. He’s being used similarly to Bell and is producing better than Bell, and if Bell was this cheap at any point last year (regardless of the matchup), he probably would have been the highest-owned player on the slate. (Bell averaged 27.9 fantasy points per game across two games against Jacksonville last year.) It’s also notable that Bell and Conner, unlike most running backs, have been more productive on the road throughout their careers. Alvin Kamara (DK: RB4, FD: RB1) ranks behind only Gurley in both expected- and actual fantasy points per game. Even since their bye (Week 7), with Mark Ingram back, Kamara ranks third in expected fantasy points per game, averaging 19.0. That’s 9.1 more than Ingram and 5.5 more than Kamara averaged last year. Over this span, he averages 15.3 carries, 4.8 targets and 1.8 opportunities inside the five-yard-line per game, compared to 11.8, 2.3 and 0.5, respectively, for Ingram. The matchup also appears to be better suited for Kamara. The Eagles are giving up 1.6 times as many fantasy points to running backs through the air as they are on the ground, which ranks second-most among defenses. In addition to being maybe the most-efficient player at his position, he also ranks third among all players in expected touchdown market share, and the Saints have the highest implied point total of the slate. 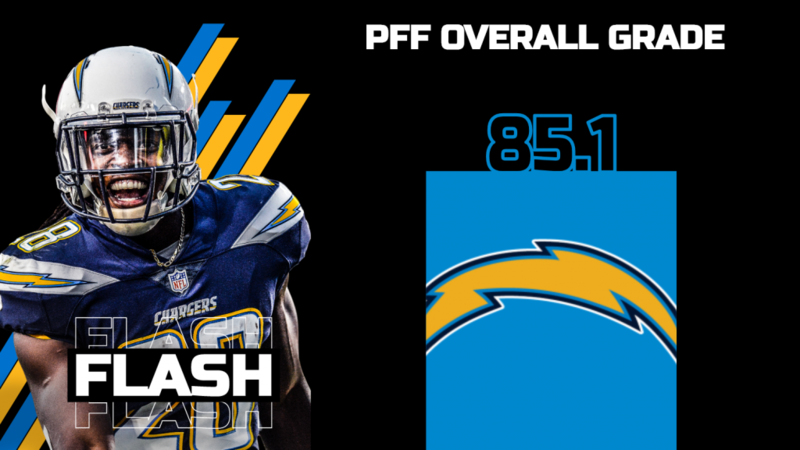 Melvin Gordon II (DK: RB1, FD: RB3) ranks third among all players in fantasy points per game and draws a Denver defense that ranks fifth-worst in yards allowed per carry (4.91) and sixth-worst in rushing yards allowed per game (117.9). With the heart of their passing attack (Keenan Allen) up against Chris Harris Jr. for the majority of his (typical / slot) routes, it makes sense for the Chargers to lean a bit heavier on Gordon in this matchup (though that wasn’t the case last year). Christian McCaffrey (DK: RB5, FD: RB4) ranks sixth among all running backs in both expected- and actual fantasy points per game. He’s a lock for five-to-eight targets and has seen between 14 and 17 carries in each of his past three games. That said, he’s only seen more than 17 carries just once this year. Though rushing volume hasn’t been great, he has been efficient on the ground (4.7 yards per carry, four rushing touchdowns over his last three games), and it’s not like he’s ceding carries to another running back (C.J. Anderson was released this week, in fact), as he ranks behind only Gurley in snaps. Though Detroit traded for Damon Harrison to try to correct this, Detroit has ranked as the league’s top run funnel defense. Detroit ranks worst in yards allowed per carry (5.25). They rank fifth-worst in points allowed per drive (2.64) and they’ve seen 37% of their total allowed yardage come via the run, which ranks third-worst. Though they also rank second-worst in opposing passer rating, so maybe they’re just bad everywhere. In any case, Carolina runs their offense through McCaffrey, and it makes sense to do so this week in a great matchup and as 4.5-point favorites. Leonard Fournette (DK: RB10, FD: RB8) totaled 27.3 expected fantasy points in Week 10 (second-most at the position) – his first game back from injury – and was productive, scoring 27.9 actual fantasy points. We already knew Jacksonville would be far more run-heavy with him active (they passed on only 41% of their plays in the first half of last week’s game) and that he’d dominate all of the work near the end zone, but it also appears HC Doug Marrone made good on his promise to get him more involved in the passing game. Like with Conner, the matchup isn’t great, but he has multiple-touchdown-upside and surely makes sense from a dollar-per-touch standpoint. David Johnson (DK: RB6, FD: RB7) is probably my favorite of these names on a per-dollar-basis, for all of the reasons I outlined earlier. Among the wide receivers on this slate, Antonio Brown (DK: WR5, FD: WB4) ranks first in expected- and third in actual fantasy points per game. On DraftKings, he’s currently the fifth-most expensive wide receiver of the slate at $7,800 – a salary where he’s hit 3X value in 50% of his games since 2014. Yes, he’ll have a tough cornerback matchup this week, but as outlined here, Brown is wholly immune to cornerback play. Case in point, Brown played Jacksonville twice last year, combining to total 30 targets, 17 receptions, 289 yards and two touchdowns. Among wide receivers, Odell Beckham Jr. (DK: WR3, FD: WR4) ranks behind only Adam Thielen (off the slate) and Brown in expected fantasy points per game. On a market share-basis, he ranks behind only Thielen and Hopkins. That’s notable this week, as the Giants get their best matchup and have their highest implied point total of the season. Though especially soft against slot wide receivers (where Beckham runs 28% of his routes), Tampa Bay is also giving up the most schedule-adjusted fantasy points per game to opposing WR1s. Michael Thomas, Julio Jones, A.J. Green and Antonio Brown combined to average 24.5 fantasy points per game against Tampa Bay. Hopkins (DK: WR4, FD: WR3) has scored in four consecutive games and is fresh off a 12-target, 105-yard performance in Denver before a Week 10 bye. Over this span, he averages 19.5 fantasy points per game, which I suppose is par for the course for Hopkins, but amazing for nearly any other wide receiver and impossibly good if factoring in the cornerbacks he’s faced. In Week 6, he was shadowed by Tre’Davious White, in Week 7 he was shadowed by Jalen Ramsey, in Week 8 he was shadowed by Xavien Howard, and in Week 9 he was shadowed by Chris Harris Jr. Those are arguably four of the league’s 10 best cornerbacks, as is Stephon Gilmore (who shadowed him in Week 1), and Janoris Jenkins is no slouch either (who shadowed Hopkins in Week 3). What happened in his other three games? He averaged 143.3 yards and 26.7 fantasy points per game. With Quinton Dunbar likely back (make sure he’s active), the Redskins won’t shadow, and they rank third-worst in fantasy points per game to outside wide receivers (where Hopkins runs 78% of his routes), and are no match for Hopkins. Coutee is also a game-time decision, which may further bolster Hopkins’ chances of a big game. Michael Thomas (DK: WR1, FD: WR1) currently ranks as our highest-graded receiver after ranking third- and seventh-best in previous years. He also leads all wide receivers (on this slate) in fantasy points per game (23.9). His volume hasn’t been as good, however, and he’s been forced to rely more on hyper-efficiency than volume. 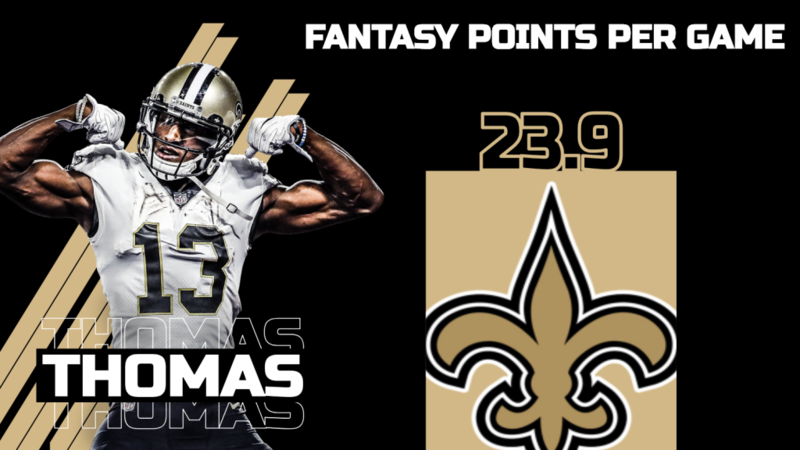 Given that Vegas has New Orleans favored by 7.5-points, it seems Thomas will need to be hyper-efficient again (like he was in Week 10) to hit value rather than draw good volume (like in Week 9). Still, that very well could happen, as New Orleans has the highest implied point total on the slate, and Philadelphia ranks third-worst in schedule-adjusted fantasy points per game to opposing WR1s. Julio Jones (DK: WR2, FD: WR2) has hit double-digit targets and 100-yards receiving in four consecutive games, and somehow that seems less impressive than the fact that he’s scored a touchdown in back-to-back games. Dallas ranks 10th-worst in schedule-adjusted fantasy points per game to opposing WR1s. It’s another brutal week at the tight end position, where it makes the most sense to pay all the way up (Ertz) or punt the position completely. Zach Ertz (DK: TE1, FD: TE1) is averaging 18.7 expected fantasy points per game, which ranks sixth-best among all receivers. It’s also 4.8 more than the next-closest tight end. It would also be the best mark by any tight end this past decade and 2.0 points more than next-closest (Jimmy Graham’s 16.7 in 2011). In terms of actual production, he’s on pace to break the all-time record for receptions from a tight end by 23 and yards from a tight end by 76. He ranks seventh among all receivers in fantasy points per game (20.4), but he isn’t priced like it. On DraftKings, he’s just the 11th-highest-priced receiver on the slate. All of this being said, the matchup is tougher than normal. The Saints rank best over the past two seasons in schedule-adjusted fantasy points per game allowed to tight ends. If looking to punt, you’ll have a few options. I like Luke Willson (DK: TE25, FD: TE28) with Michael Roberts and Marvin Jones out. The matchup is ideal, as Carolina ranks worst in schedule-adjusted fantasy points per game to opposing tight end. James O’Shaughnessy (DK: TE20, FD: TE45) is a strong play at a near-minimum price-tag on both sites. Since Austin Seferian-Jenkin’s Week 4 injury, Jacksonville’s TE1 is averaging 5.0 receptions and 38.0 yards per game. That would rank fifth- and 12th-best, respectively, over this span. Pittsburgh ranks eighth-worst in schedule-adjusted fantasy points per game to opposing tight ends. Ricky Seals-Jones (DK: TE14, FD: TE16) is cheap as well and has seen better usage since OC Byron Leftwich has taken over, averaging 6.5 targets and 36.5 routes per game (as opposed to 4.7 targets and 25.7 routes per game in all other games). Oakland ranks fourth-worst in schedule-adjusted fantasy points per game to tight ends. In the middle pricing tiers, I like Austin Hooper (DK: TE4, FD: TE4) and Jeff Heuerman (DK: TE11, FD: TE10). I wouldn’t bank on it, but both have double-digit target potential. Hooper has seen double-digit targets in three of his last five games. Meanwhile, Heuerman appeared to be the main beneficiary of Demaryius Thomas’ absence, drawing 11 targets in Week 9.